EZFacility offers a broad range of scheduling, billing, and reporting capabilities that are designed to help fitness businesses operate smoothly and make better business decisions. Founded in 2003, EZFacility provides a comprehensive set of features for fitness businesses that are looking to streamline their everyday operations. One of the most impressive aspects of the software is that it gives gyms the chance to offer a custom branded mobile app for their members, without creating one from scratch. The software is also designed with sophisticated custom reporting capabilities that allow you to extract valuable insights about your most popular classes, best and worst revenue sources, peak gym hours, and more. Is EZFacility the right software for you? EZFacility is a cloud-based fitness management software that does exactly what its name suggests--it makes it easier to automate a lot of your daily operations like payroll, scheduling, and point-of-sale inventory tasks. It also offers the ability for you to generate custom business intelligence reports that will help you understand your business, from peak hours of activity, to marketing campaign effectiveness. If you need a comprehensive solution to meet all of your fitness business needs, EZFacility is worthy of your consideration, as it's currently used by thousands of fitness businesses. Easily create schedules for personal trainers and instructors. Point-of-sale system helps you generate income from retail sales. Users can submit ideas in the suggestion box. Users report that billing for monthly packages or other special circumstances is overly complicated. Doesn't support the creation of family accounts, which would simplify billing/membership management. Currently only integrates with one credit card processor, Constellation. Headquartered in New York and founded in 2003, EZFacility is a comprehensive web-based fitness business mangement software solution that will serve the needs of a wide range of gyms. It will appeal to owners who want to be able to generate reports about every aspect of their business, whether it's membership churn rate, or trainer performance reports. Gym owners can also create a custom mobile app that members can download in order to be able to book classes online. Below, we discuss the key features of EZFacility, and how they can benefit your business. 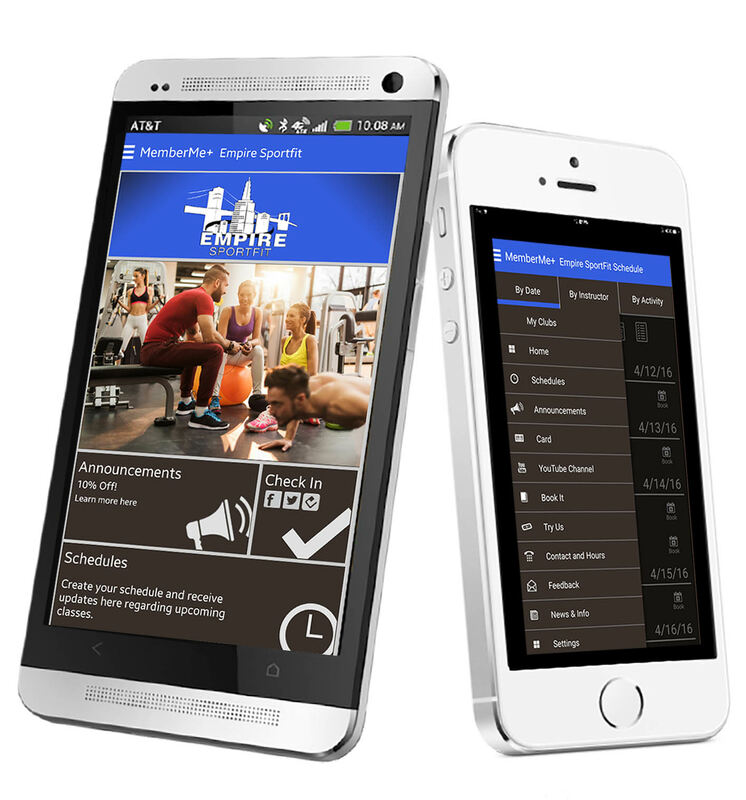 EZFacility gives gym owners an easy way to create a custom branded mobile app to reach their members. Your members will be able to download your cusotm app through the Apple App store or the Google Play store, branded with your logo. You can customize the images, look, and feel of the app as you wish, to align with your gym's personality. The mobile app gives your members a convenient way to book classes, view upcoming schedules, and more. You can also use the mobile app to communicate news to your members and experiment with marketing campaigns, such as discounts on personal training sessions, membership packages, and more. For example, if you need to fill in a few more slots in your 7 pm aerobics class, you can try sending out a promo code to your members. Later, you can generate reports to compare and contrast what worked and what didn't. Marketing and reporting capablities help you engage with current clients and attract new ones. For example, you can create a report to help you identify members who are due for membership renewals, or whose credit cards are about to expire, and reach out to them by phone, email, or text. By taking advantage of EZFacility's marketing features, you can increase member retention and avoid losing revenue. You can even identify people whose memberships are about to expire (or recently expired), and offer them a promo code that may persuade them to renew. Reporting is a crucial aspect of running your fitness business. If you have access to data and insights about your current members, sales, and revenue, you can continue to improve your business and attract the right clients to keep growing your business. EZFacility was designed with extensive custom reporting capabilities, which enables users to generate financial reports about their retail sales, as well as assess their business's peak hours. Virtually any question can be answered with the right reporting tool, and EZFacility helps you export the resulting data in any format you wish, whether it's a PDF, Excel, Word, or something else. EZFacility helps you automatically bill your clients and generate payment schedules to make sure you get paid regularly and on time. You can specify different rates for various services, and automatically notify members when their credit cards are about to expire. EZFacility has partnered with a PCI-DSS-compliant credit card processor, Constellation Payments (CSIPay), which helps give your clients a convenient way to pay for membership fees and retail products. EZFacility helps busy gym owners keep track of scheduling across various facilities and trainers/instructors. You can create daily, weekly, or monthly schedules and give each of your trainers an individual login to track their hours and check their schedules from home. Since all of this information is logged in the software, you can also extract that data in the form of useful reports about payroll and commission for your instructors and trainers. EZFacility understands the complex nature of payroll in a fitness club setting, so it enables owners to specify custom pay rates for each member of their staff. For example, you can set an hourly wage for your front desk employees, and a commission-based pay for other members of your staff. You can also export payroll and commission reports and analyze them later to assess what services are more popular with your clients, along with other valuable insights. With a full-featured point-of-sale system, you can easily create an additional revenue stream for your business and offer your members access to products that they need. EZFacility's POS system also enables you to create coupons and promotions, while also helping you keep track of inventory and revenue. You can also analyze reports to assess what kinds of products and promotions generate more sales. Although EZFacility includes features that help streamline day-to-day operations (scheduling, payroll, and billing), it really excels in two other areas: its custom branded mobile app, and its ability to provide insights through comprehensive reporting capabilities. If you expect that you will be able to take advantage of these features, EZFacility is a great option that can help you drive your business forward for many years to come.